Darren Bundock and Nina Curtis at 2/3am Australian time this morning (Sunday 4th October 2015) - Silver Medallists! The Nacra 17 European Championship kicked-off in Barelona, Spain earlier this week with Olympic silver medallists Darren Bundock (NSW) and Nina Curtis (NSW) representing the Australian Sailing Team. On Saturday October 4th after they defending their 2nd place after four races on Friday, the Bundock/Curtis Team maintained their position to secure the Silver Medal. At 2 a.m. this morning, which suddenly became 3 a.m. as the clocks went forward, the Barcelona International Sailing Center released the above wonderful picture. Hosted at the Barcelona International Sailing Center (BISC) 43 teams from 24 countries competed in Barcelona in a high-profile fleet, which included thirteen Olympic medallists and defending European champion and dual Olympic medallist Iker Martinez. The mixed-gender, multi-hull catamaran Nacra 17 will be new on the Olympic racing schedule for Rio 2016 with two Australian Sailing Team crews currently competing for selection. “We’ve been here for ten days training and put in a lot of work so we’d like to have a good result here. But we’ll just wait and see how we go. We’ve a lot of good competition here so it should be a really good championship. Unfortunately the current World Champions are not here (FRA), but besides that it should be good competition and after ideal training conditions we’re looking forward to the racing,” Darren Bundock said. 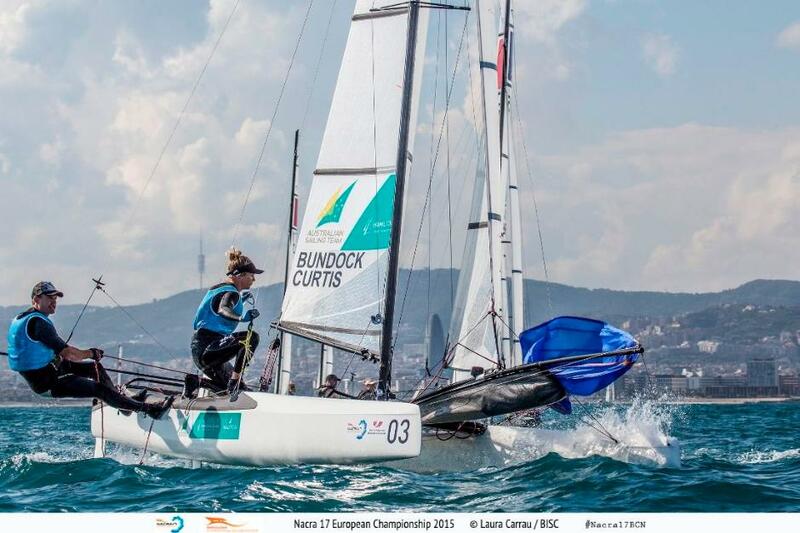 Darren Bundock and Nina Curtis arrived in Barcelona following the 2015 Rio International Sailing Regatta. With only one entry per country in Rio, they were training partners for Australian Sailing Team mates and Rio 2016 rivals, Nacra 17 World Championship silver medallists and Rio winners Jason Waterhouse and Lisa Darmanin who did not compete in Barcelona. “We have had a good training camp here in Barcelona with a good variety of winds and conditions and some great weather. We are really happy with the improvements we have made after getting some solid training blocks under our belt both here and in Rio,” Nina Curtis said. “The calibre of fleet here in Barcelona is strong and while this regatta isn't a selection event for us, it is for many of the other nations so we are expecting some great racing. We’ll have five days of racing plus one medal race. All boats are in one large fleet so racing will be tight and exciting,” Nina Curtis added. The 2015 Nacra European Championship was organized by the Sports Federation Union of Catalonia (UFEC) and the Catalan Sailing Federation, with the support of the Barcelona City Council, the Government of Catalonia, Barcelona Royal Yacht Club (RCNB) and the Royal Maritime Club of Barcelona (RCMB). The Nacra 17 European Championship officially started on Monday, September 28th, and ran until Saturday, October 3rd. Olympic silver medallists Darren Bundock (NSW) and Nina Curtis (NSW) have won the silver medal at the 2015 Nacra 17 Open European Championships in Barcelona, Spain last night (Saturday, 3 October). Winds of up to 12 knots offered ideal conditions for the exciting final at the Nacra 17 European Championship. The event finished on Saturday after a total of eleven races over four days of racing and after two competition days had to be cancelled due to too much wind or the lack there of. Darren Bundock and Nina Curtis went into the final top ten Medal Race ranked second and after a sixth place in the double-points Medal Race finished the event in overall second and four points behind the British winners Ben Saxton and Nicola Groves. "It was a very strange race today, the positions changed a lot and we were first place for a while, but we finally lost and finished overall second. The British have done a great job. It was a great championship and I think everyone is happy. The setting was magnificent, with very good facilities, so we had good racing," Darren Bundock said. Three points behind the Australians, completing the podium of the open championship and claiming the European silver were Olympic medallist Allan Norregaard and his crew Annette Viborg from Denmark. Hosted at the Barcelona International Sailing Center (BISC) 42 teams from 23 countries competed in Barcelona. 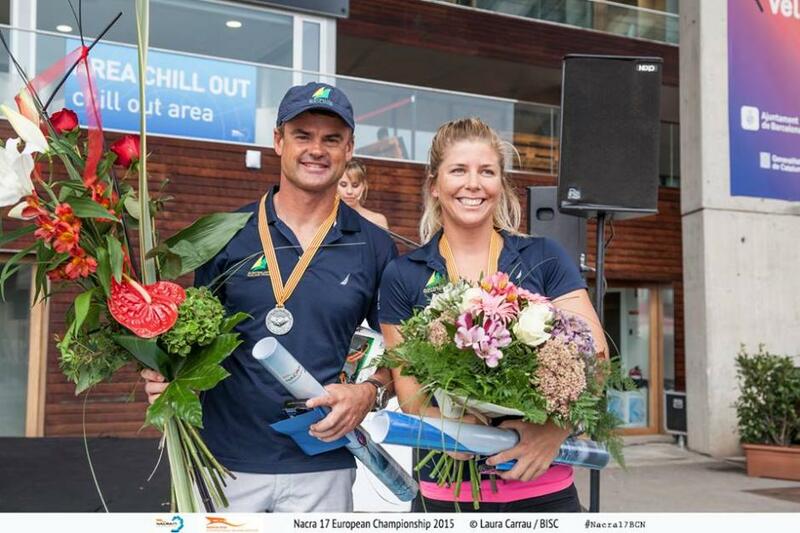 Darren Bundock and Nina Curtis were the only Australian Team crew competing in Spain. The Nacra 17 European Championship was organized by the Sports Federation Union of Catalonia (UFEC) and the Catalan Sailing Federation with the support of the Barcelona City Council, the Government of Catalonia, Barcelona Royal Yacht Club (RCNB) and the Royal Maritime Club of Barcelona (RCMB). Results Darren Bundock & Nina Curtis: 5, 10, 4, 2, 3, 7, 7, 13, (14), 5, 6 – 2nd.